Imagine how much energy and cost you could save if you generated power for your timber home from the sun. Most people would agree that the ability to generate their own solar power sounds great, but how practical is it? Residential solar panels, or photovoltaic (PV) panels, have been around for a long time. When first introduced, they were expensive and limited in the amount of power they could generate. But, the last decade has produced an amazing array of technology, and the science behind solar energy has also taken big leaps. The cost to install solar panels has decreased because of these leaps in technology. How much power is it possible to produce with solar panels? 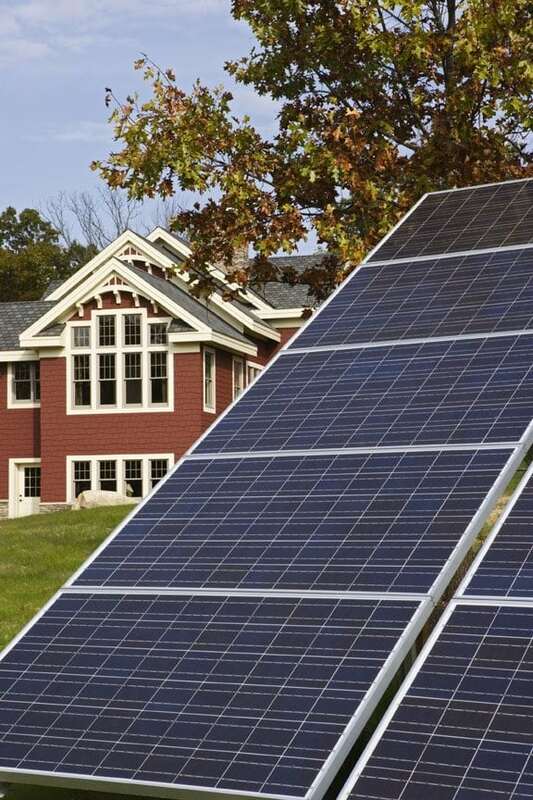 The type of panels you select and the size of your system determines how much power you can generate for your home. How much energy would you like your panels to produce? Many homeowners aim to offset the use of their HVAC system with solar while others want to produce all the energy they use. To determine the size solar panel system you need, consider how much energy you currently use. Then, consider any changes that may increase or decrease your energy use. Are you planning on building your retirement dream home in Arizona? You might want to generate more power than someone in Tennessee or Michigan. How does geographic location impact productivity of solar panels? Across the country, there is a slight difference in the amount of energy PV panels can produce. Locations closer to the equator and locations that have more direct sunlight have the ability to create more energy than locations farther north. However, even on cloudy days, the sun still shines and transmits the radiation needed to create energy for your home. Solar panels can even generate energy during the rain. No matter your location, your panels will create power when you are consuming it the most … on warm summer afternoons. What does it cost to install solar panels? Are they worth the investment? HomeAdvisor.com estimates the national average to add a solar power system to your home to be about $22,000. If you install solar panels while building a new home, you can incorporate it into your mortgage. Theoretically, the additional monthly cost will be made up by a reduction in your energy bill. While the savings varies by the cost of power in your location, as electricity gets more expensive over time, investing now caps your electrical costs for the next 25 to 30 years. So, is it worth the cost? HomeAdvisor.com estimates the savings of an average-sized solar panel system can reduce your monthly energy bill by 50%. Over a 20-year period, the savings can add up to $30,000. National and local tax credits can also help offset the initial cost. What home design considerations do I need to make for solar panels? If you want to install solar panels on your new home, now or in the future, tell your architect early in the design phase. They will take into consideration your home’s site orientation to ensure part of your roof faces the best direction to capture the maximum amount of solar radiation. Your roof will also need to be away from any trees that might shade it. The weight of the solar panels on your roof may also change the amount of structural support it needs. If you plan to add panels at a later date, you can save money by building the support and electrical connections needed while building your new home. Of course, generating energy is only one side of the coin. The other step is to build a very efficient home. The more efficient your home, the less energy it you will need to produce. 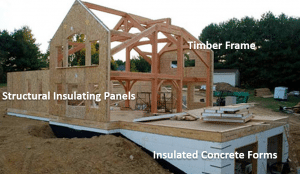 Timber frame homes built with insulated concrete form foundations and structural insulating wall and roof panels are extremely more efficient than stick-built homes. For more information, check out our Building an Energy Efficient Home from the Ground Up webinar here.